NECA resurrects everyone's favorite momma's boy just in time for his all new feature film. Jason is back and it means sheer terror for the good people of Camp Crystal Lake. 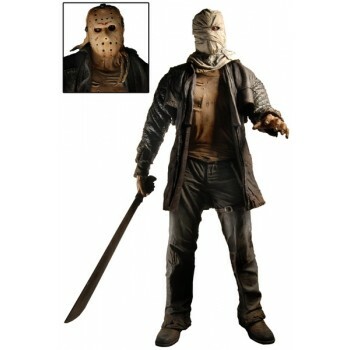 Jason stands 19" high, and features two interchangeable heads; his classic "sack" look, and the much more traditional hockey mask. Jason is fully articulated, and comes with his machete. The machete can be slid in and out of a convenient sheath on his belt.